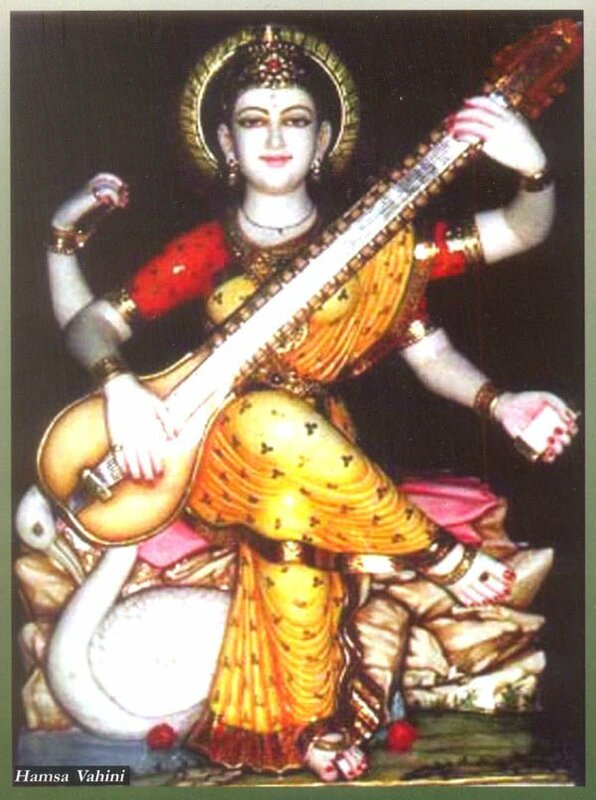 Right from the Vedic period three faces of Sarasvati are projected-as a source of inspiration, as goddess of Vak (word) and as a stream of purity. 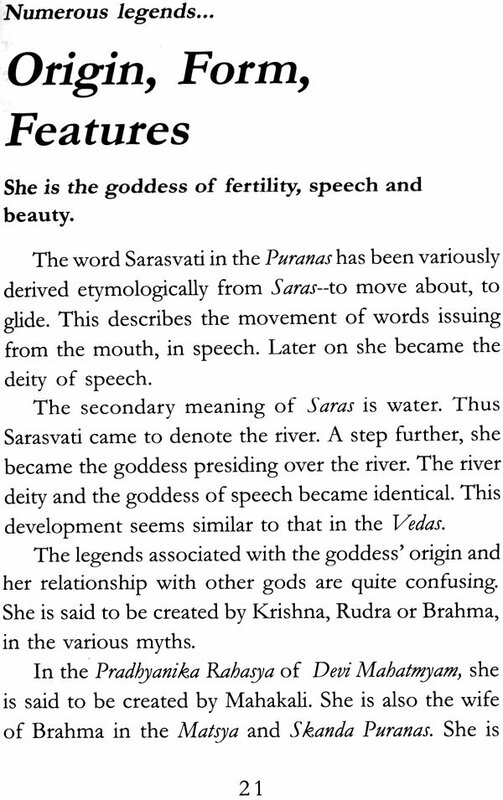 In the Puranas and in Hindu thought, Sarasvati is the goddess of speech. 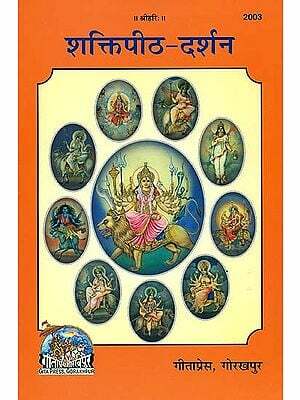 Extending her Vedic image as the source of inspiration, she is extolled as the word, the voice, speech and eloquence. 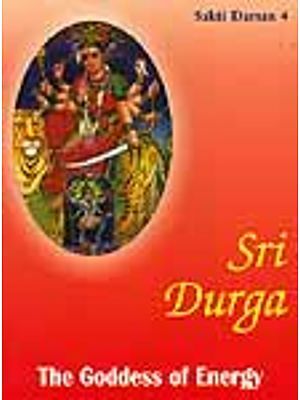 This book describes the development of the concept of Sarasvati in the Vedas, the Puranas and other sacred literature. A lesser-known aspect as goddess of war and fertility is also brought out in one of the articles. 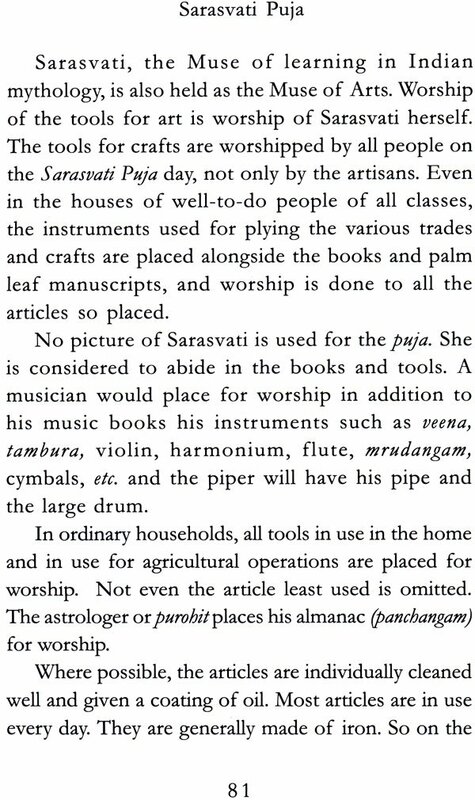 It is in the Puranas that Sarasvati is fully depicted with a personality, thought some of the attributes were mentioned in the Vedas, showing her as dressed in white with symbols in hands, such as the rosary, the book, the lute and the jar of nectar. 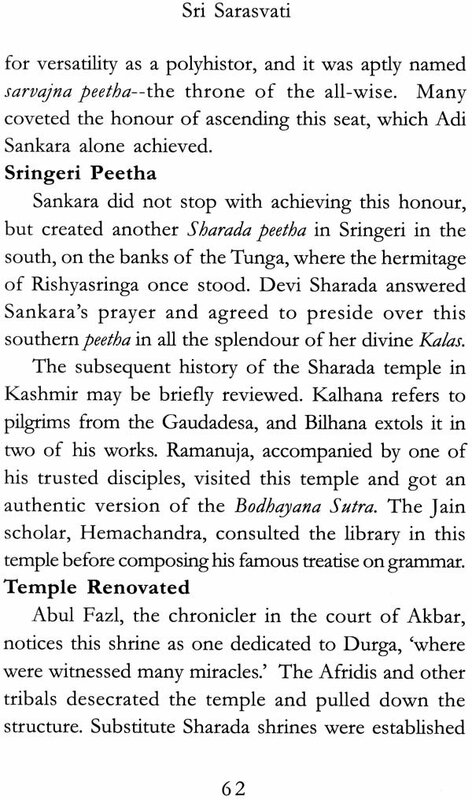 Legends associated with the origin of Sarasvati are also highlighted. 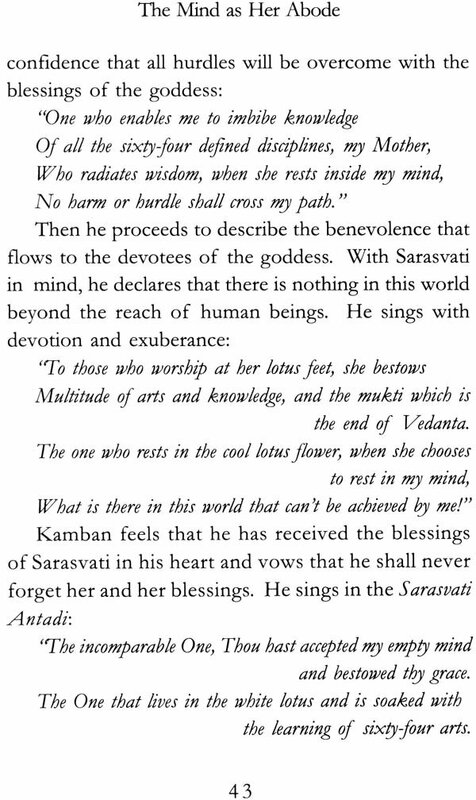 The ten mantras of Sarasvati Rahasya Upanishad are dealt with in an interesting feature. 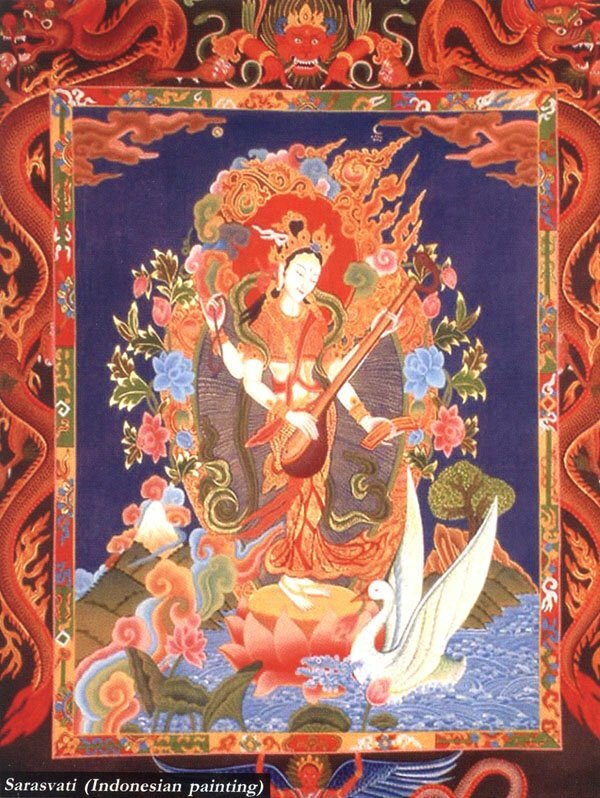 Each mantra beings with a secret syllable and is powerful in invoking the grace of Goddess Sarasvati, by sharpening the mental faculties of the devotees and developing their power of expression. 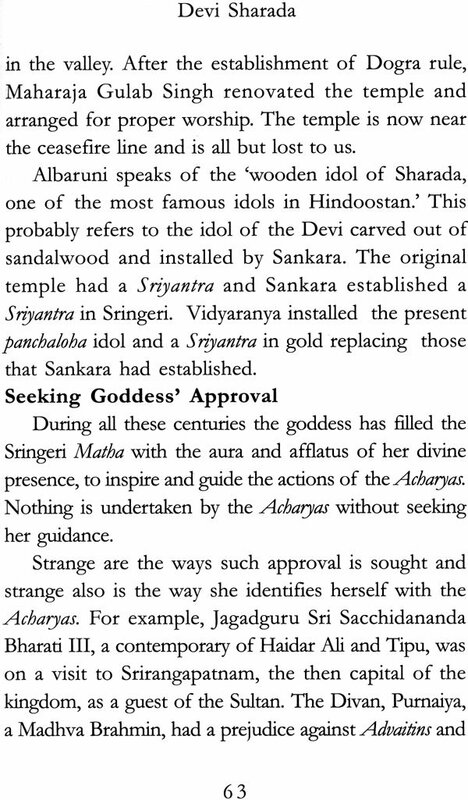 The article, Vara Veena on the popular song in south India, abounds in Vedic references, confirming that Sarasvati is the same as Lakshmi and other deities. 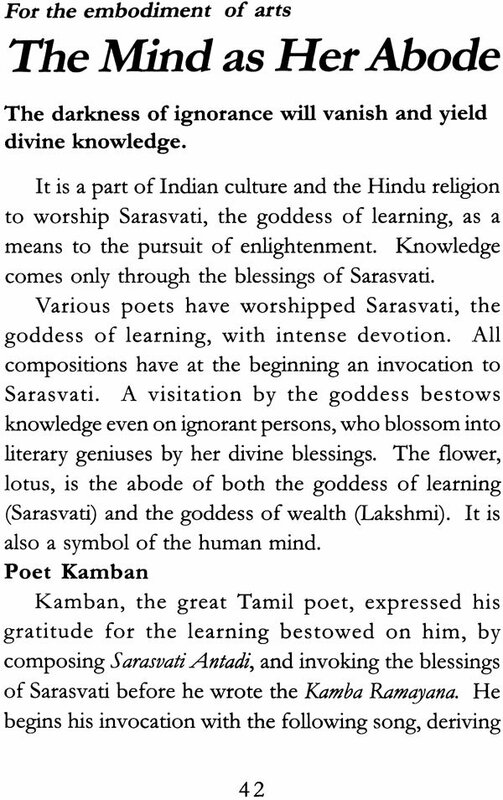 That the power of Sarasvati is behind the poetic genius of bards, such as Kamban and Kumaragurupara, in Tamil Nadu, is also featured. 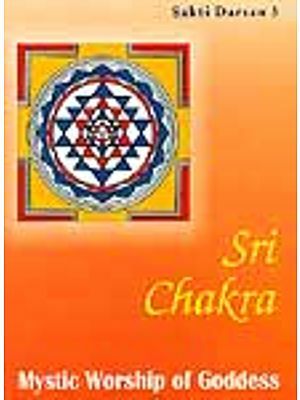 That there are lesser known Vahanas (vehicles) of Sarasvati, such as the ram, bull, serpent and lion, besides the swan and the peacock, is brought out in an interesting article. 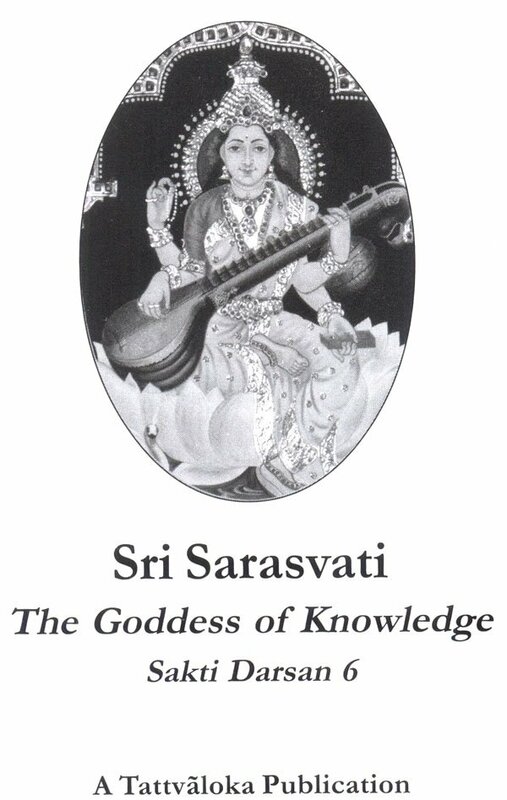 Devi Sharada, also known as Kasmirapurivasini and Sringerivasini, is another aspect of Sarasvati. Instances of her benevolence are also featured. 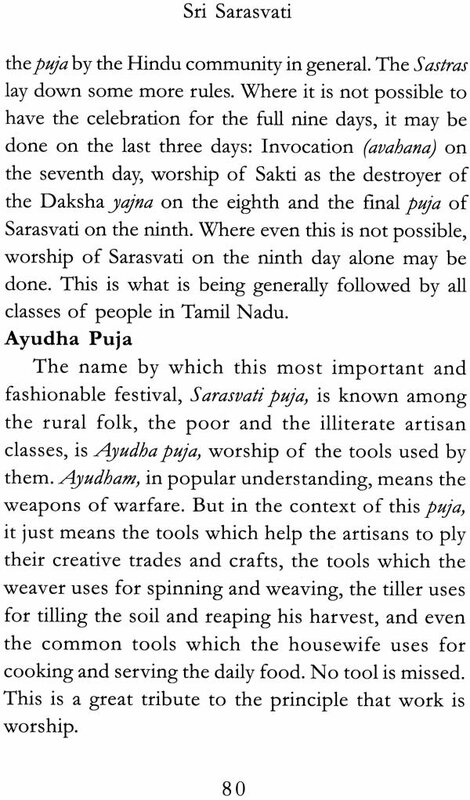 An original interpretation about the antiquity of the Vedic civilization, associated with the river Sarasvati, is the highlight of another article, which says that the Indus Valley culture, usually considered to be the oldest known culture in India, is actually post-Vedic. Light is also thrown on little known facts about the Sarasvati cult in Nepal, Tibet, Indonesia and Japan. 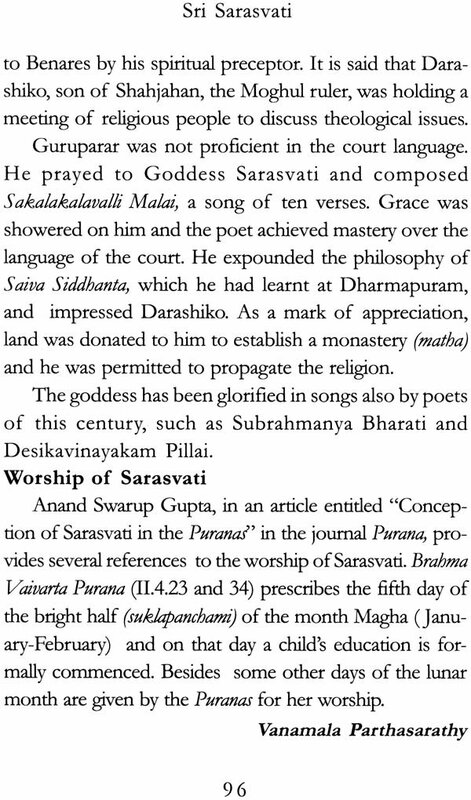 Five sacred songs have been included in which well known poets, such as Rabindranath Tagore and Vishvabandhu, and great saints, such as Eknath and Purandaradasa, have poured out their deepest feelings for Sarasvati, the source of their inspiration.